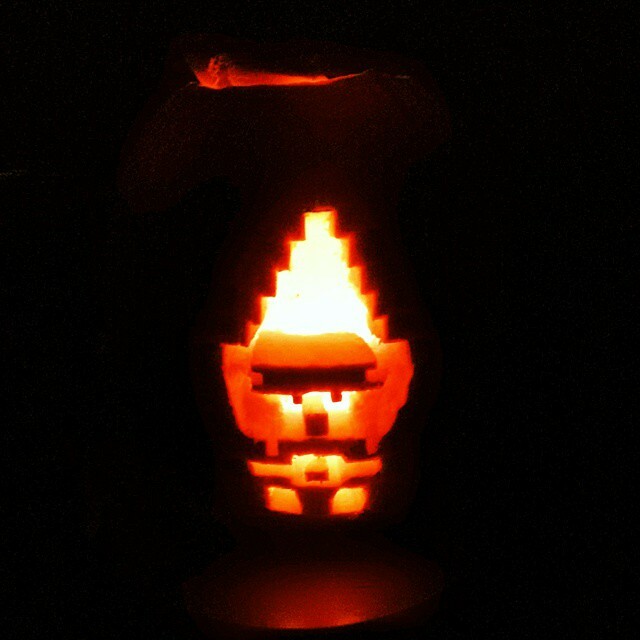 When I decided to do a retro-themed pumpkin contest this year on Instagram, I didn’t expect so many participants. In yesterday’s post, I announced the first, second and third place prize winners of the contest. But today, I wanted to make sure that I discussed some of the top ten contestants who all came pretty close to winning and certainly merit some acknowledgement. 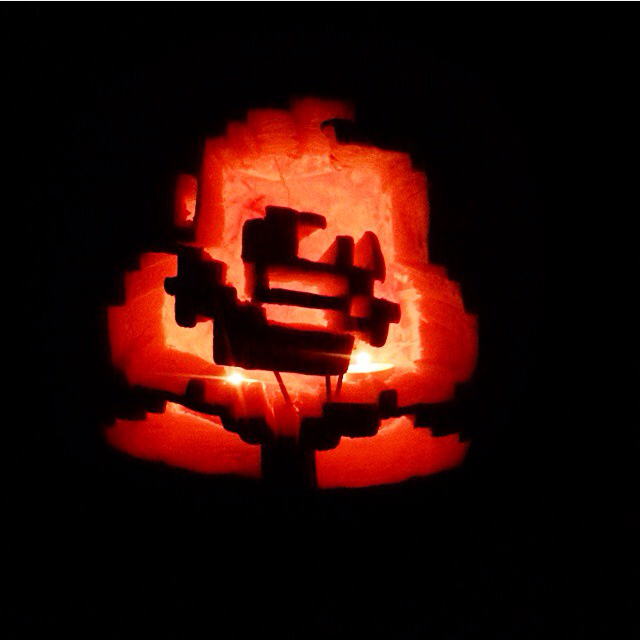 As Retro Chronicle deals a lot with retro games, there were expectantly a lot of retro game-inspired pumpkin carvings. So all of these have gaming connections, even though there were also many great non-gaming entries. According to Chris, this is his first time carving a pumpkin. And he chose the titular mask from the Legend of Zelda’s sixth installment. 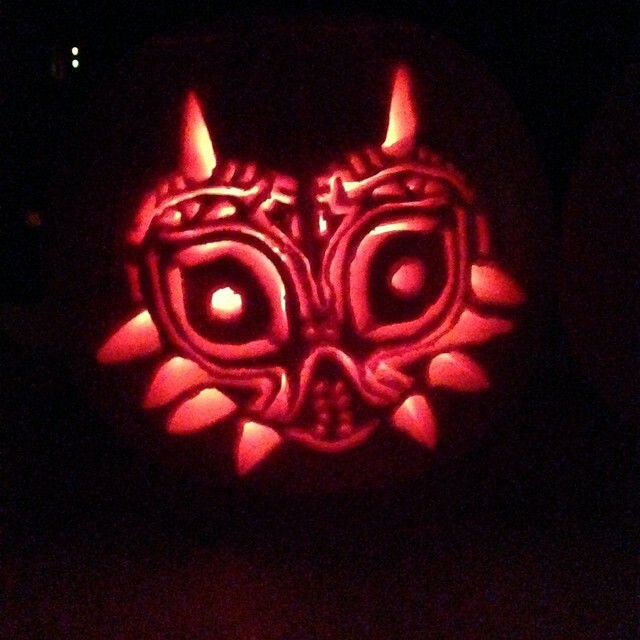 This was definitely appropriate, as Majora’s Mask is considered by critics to be “darker” among the Zelda games. “When I was carving the egg, I noticed that the inside edges change the way the shape of the hole looks when viewed at an angle. So I carved away more of the inside edges, so they look more like the shape I wanted,” said Frankie, who is a U.S. Marine Veteran and a professional photographer according to his Instagram account. He also one first place in the Retro Pumpkin Contest with his Samus carving. 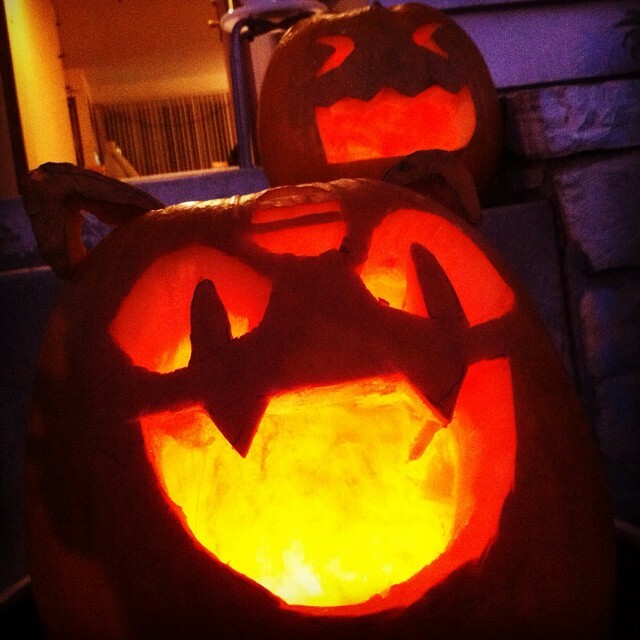 This Los Angeles-born got a lot of great feedback for these pumpkins, which feature two of Team Rocket’s (the villains of the Pokemon series) sidekicks– Meowth and Wobbuffet. Meowth is probably the most famous of villainous sidekicks in the Pokemon universe, but there is a great following for the psychic Pokemon Wobbuffet, who made his first Anime appearance when Jessie accidentally trades her Lickitung for this typically useless Pokemon. Chance spent about 45 minutes on this one, and the detail really shows. The Nintendo 64 (199) is still one of the most beloved Nintendo consoles ever released. The colors on the pumpkin also add a lot of character. This one was submitted on Emily’s behalf by Rob, who live in Illinois. Vivi Orunitia (a user of black magic) is best known for his role in Final Fantasy IX. He is garbed in blue, wears a tall yellow hat, and has no facial features beyond a set of yellow eyes. So he’s the perfect choice for a pumpkin carving as the yellow light from the candle inside illuminate his yellow eyes. Emily and Rob love this Final Fantasy character so much that they named their cat after it. According to Quinn, this is the first pumpkin he’s ever carved. Since this was a retr0-themed contest, we got a lot of awesome 8-bit renditions of classic gaming and non-gaming characters. This was one of my personal favorites– Link from the very first Legend of Zelda. 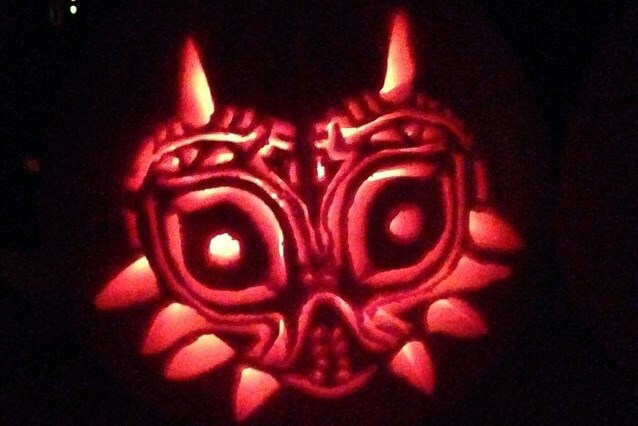 Fans who saw this pumpkin were probably filled with nostalgia, as this was one of the pivotal points in the original game. 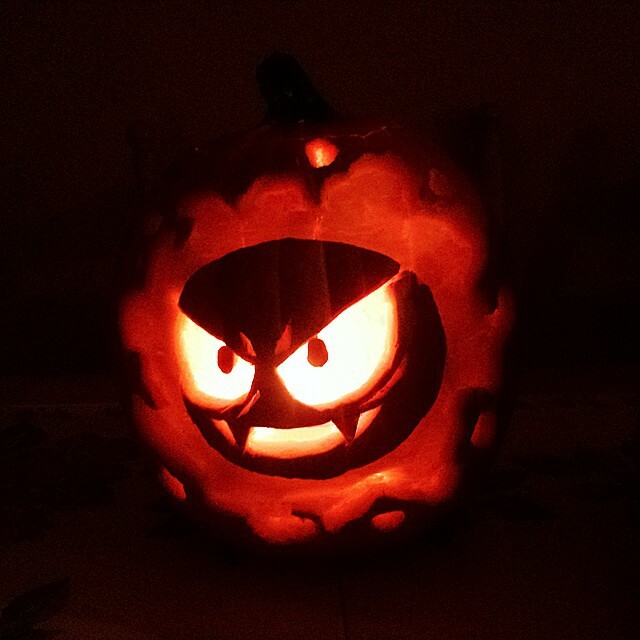 Marj carved another in a series of Pokémon-inspired pumpkins, this time in the ghost Pokemon Ghastly. Gastly appears to be nothing more than a black ball of ghostly matter that is surrounded by a purple glow of smog. Gastly has big, white eyes and a mouth with a pair of fangs in it, making it an awesome choice for a Halloween pumpkin. 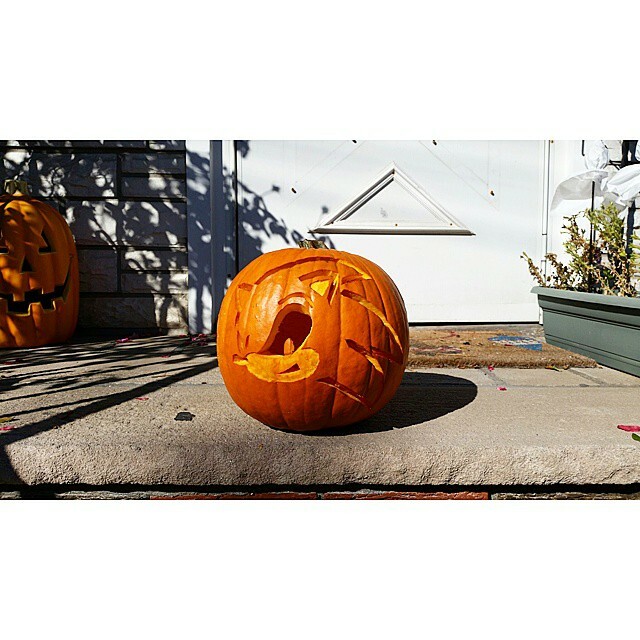 New Jersey-based Anne represented Team Sega this year with this awesome Sonic the Hedgehog pumpkin. 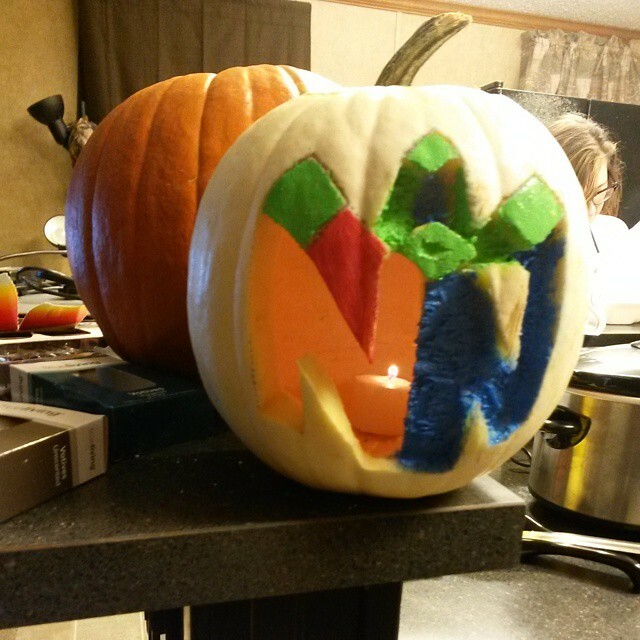 Unfortunately, there weren’t nearly as many Sega-inspired pumpkins as I would have liked there to be. 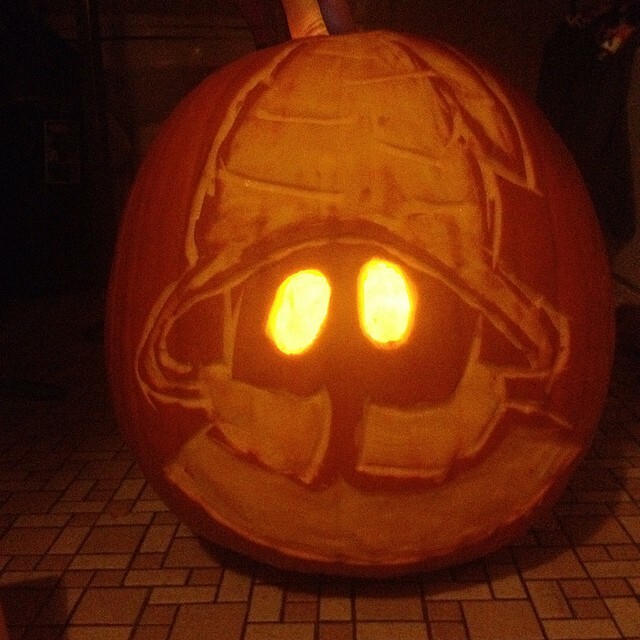 Anne did an awesome job with this Sonic pumpkin with some really precise carvings for his ears and outlines. This one was ambitious. Steven could have played it easy with a pie chart-shape with an eye hole. But no, he carved the entire game screen. He did a great job punturing holes for each of the game’s little dots with Pac-man about to consume a ghost in the upper left corner. This one is a lot of fun to look at. “Since almost everyone was going Nintendo, I decided to pick the beloved retro classic, Pac-man. I love playing the original Pac-man, and especially the many other versions (my favorite being Ms. Pac-man Maze Madness). 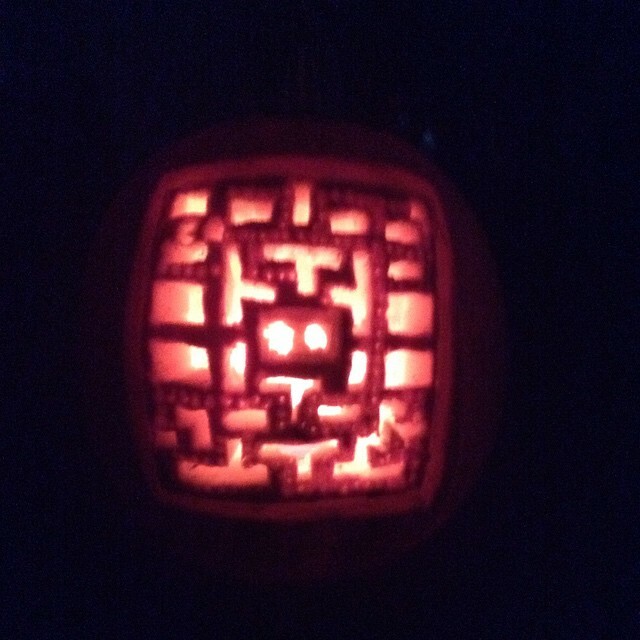 The pumpkin was insanely fun to create but also very tricky. I had a lot of fun making my entry,” said Steven. 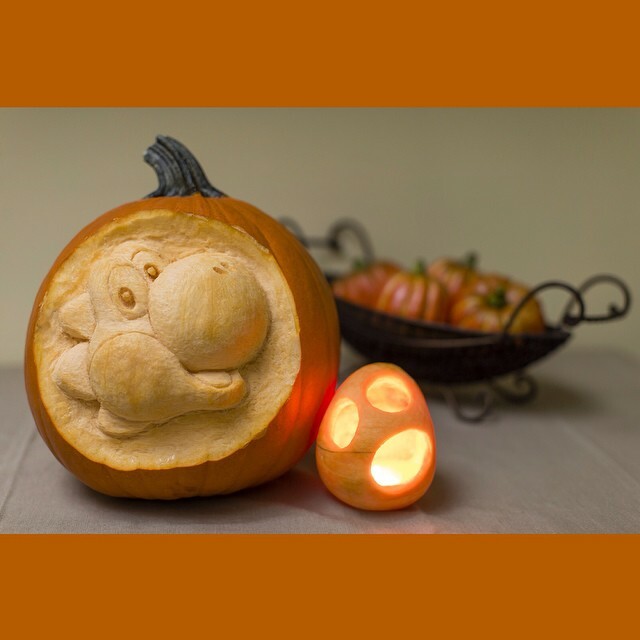 In addition to this pumpkin, Alfredoobie submitted four equally-outstanding pumpkins for the Retro Pumpkin Contest– including one of Bowser, a Shy Guy and the Legend of Zelda symbol. Fans of Mega Man were no doubt excited to see that Mega Man would appear in the newest installment of Super Smash Bros.